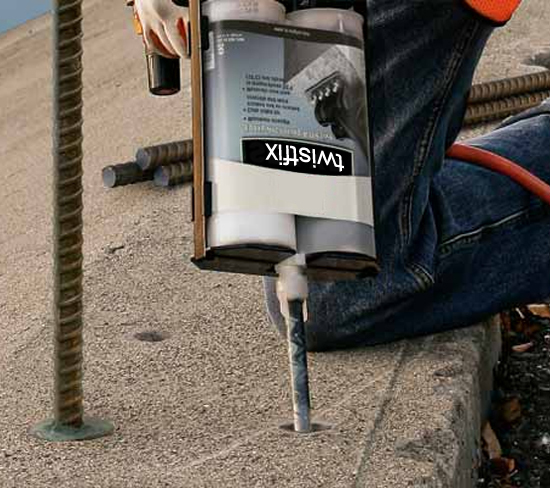 The terms 'resin anchor' and 'chemical anchor' relate to the selection of steel bolts, studs and anchorages used in conjunction with a resin-based adhesive into a concrete or masonry substrate. When carrying out this complex and delicate process, it is essential that the correct type of resin is selected in order to ensure the strength and durability of these fixings. Understanding the varying qualities of different resins makes choosing the right one much easier. Chemical anchors are perfectly suited for use in high-load applications as the resultant bond achieved exceeds the strength of the base material itself. Based on a system of chemical adhesion, the base material receives virtually no point-load stress, unlike when using expansion-type anchors. This makes chemical anchors perfect for close-to-edge fixing, group anchoring, reduced-centre and for use in masonry with low or unknown quality and compressive strength. There are three main types of resin available: unsaturated polyester, epoxy acrylate and pure epoxy. These are sometimes used in combination to create what is known as a 'hybrid system'. Unsaturated polyester is a reactive resin used to produce dual-component injection mortar. This process involves combining unsaturated polyester resins, some of which have been dissolved in styrene, to quickly create injection mortars that are simple to use. In alkaline media, unsaturated polyester resins may offer limited chemical resistance. Epoxy acrylate resins combine the efficient mechanical and thermal qualities of epoxy resins with the ease-of-use and speed offered by those made from unsaturated polyester. Also known as vinylester resins, these new-generation products are styrene-free, relying instead on less harsh dimet­hac­rylates as a reactive solvent. These resins and the mortars produced from them show a much higher chemical resistance than unsaturated polyester resins, particularly when used in alkaline media. Epoxy resins offer the highest performance and highest strength chemical injection anchoring solution for heavy duty structural applications. Premium grade epoxy resins deliver great mechanical and thermal properties, show incredibly high chemical resistance and are almost 100% shrink resistent. A strong compound-properties profile means epoxy resins easily achieve outstanding load values when used in large annular gaps and diamond-drilled holes. 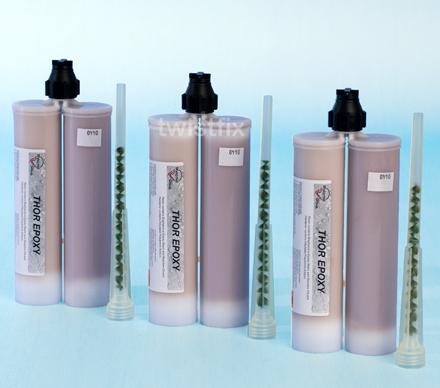 Twistfix supply a comprehensive range of anchor resins and our expert team are always available to offer clear advice and information on selecting exactly the right product for the job. There are lots of ways to contact us so do it today and drop your anchor in the right place every time with our chemical anchors!